Luckily, these adorable Peropon Drinking Animal Planters need next to no attention whatsoever. You can reap the benefits of oxygen-giving, sweet smelling miniature plants without lifting a single digit. All it takes is a sip of their tongue and the plants on their backs fill with delicious nourishment. They’re completely self-sufficient, unlike those other pesky house plants…so needy. 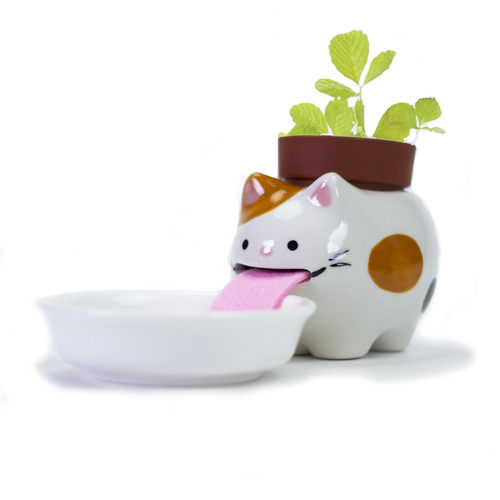 Choose from four different ceramic critters, each with their own type of plant perched atop their sweet little heads. These stubby-legged pets are ready to brighten up your desk or window sill. Their chirpy faces seem to say everything is going to be alright.